سلحشور, زینب, شهبازی, افسانه, بدیعی, علیرضا. (1394). سنتز و اصلاح سطح سیلیس نانو حفره با گروه‌های مونو و دندریمرآمین به‌منظور حذف رنگ متیلن‌بلو از پساب. مجله آب و فاضلاب, 27(1), 19-28. زینب سلحشور; افسانه شهبازی; علیرضا بدیعی. "سنتز و اصلاح سطح سیلیس نانو حفره با گروه‌های مونو و دندریمرآمین به‌منظور حذف رنگ متیلن‌بلو از پساب". مجله آب و فاضلاب, 27, 1, 1394, 19-28. سلحشور, زینب, شهبازی, افسانه, بدیعی, علیرضا. (1394). 'سنتز و اصلاح سطح سیلیس نانو حفره با گروه‌های مونو و دندریمرآمین به‌منظور حذف رنگ متیلن‌بلو از پساب', مجله آب و فاضلاب, 27(1), pp. 19-28. سلحشور, زینب, شهبازی, افسانه, بدیعی, علیرضا. سنتز و اصلاح سطح سیلیس نانو حفره با گروه‌های مونو و دندریمرآمین به‌منظور حذف رنگ متیلن‌بلو از پساب. 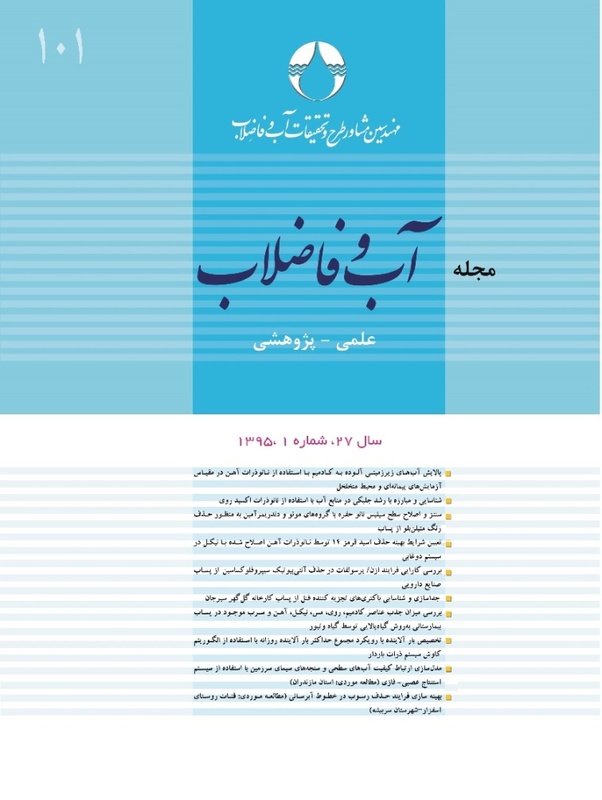 مجله آب و فاضلاب, 1394; 27(1): 19-28. بسیاری از رنگ‌های آلی مانند رنگ کاتیونی متیلن‌بلو به‌دلیل ساختار پیچیده آروماتیک و حلالیت بالا در آب، سمی، سرطانزا و غیر قابل تجزیه‌ زیستی می‌باشند، لذا حذف آنها از پساب ضروری است. در این تحقیق، سیلیس نانوحفره SBA-15 به‌روش هیدروترمال سنتز و سپس به‌روش پساسنتزی با گروه تک‌شاخه آمینی (NH2-SBA-15) و دندریمرآمینی ‌(MDA-SBA-15) عامل‌دار شد. اثر اصلاح سطح بر روی کارایی جذب رنگ متیلن‌بلو در سیستم ناپیوسته بررسی شد. ویژگی نانو جاذب‌های سنتز شده با استفاده از آنالیزهای XRD، FT-IR، SEM و BET انجام شد. نتایج نشان داد که در شرایط یکسان، کارایی حذف متیلن‌بلو با استفاده از نانو جاذب MDA-SBA-15، 37 میلی‌گرم بر گرم است که به‌ترتیب 6/2 و 3/3 برابر بیشتر از این کارایی برای جاذب‌های NH2-SBA-15 و SBA-15 است. فرایند جذب با استفاده از چهار مدل‌ ایزوترمی لانگمیر، فروندلیچ، تمکین و دوبینین-رادکوویچ مدل‌سازی شد. همبستگی زیاد داده‌ها با مدل جذب لانگمیر بیانگر جذب تک لایه‌ای متیلن‌بلو بر روی MDA-SBA-15 است. پارامترهای حاصل از ایزوترم تمکین نشان داد که روند جذب با MDA-SBA-15 گرمازا است. کارایی بیش از 90 درصدی MDA-SBA-15 نسبت‌ به دو نانو جاذب دیگر در حذف رنگ متیلن‌بلو از محیط آبی نشان داد که می‌توان از آن به‌عنوان یک جاذب موثر در فرایند تصفیه استفاده نمود. Many organic dyes such as Methylene Blue are toxic, carcinogenic, and non-biodegradable due to their aromatic complex structure and high solubility in water. It is, therefore, essential to remove them from effluents discharged into the environment. In this study, SBA-15 mesoporous silica was synthesized by the hydrothermal method and later functionalized with mono- amine (NH2-SBA-15) and dendrimer amine (MDA-SBA-15). Then, the effect of surface modification on adsorption efficiency of Methylene Blue was examined in a batch system. The prepared materials were characterized by XRD, FT-IR, SEM, and BET analyses. The results showed that, under identical conditions, removal efficiency with MDA-SBA-15 was 2.6 and 3.3 times higher than those achieved with NH2-SBA-15 and SBA-15, respectively. Equilibrium isotherms were analyzed by Langmuir, Freundlich, Tempkin, and Dubnin–Radushkevich isotherms. Equilibrium data was best described by the Langmuir isotherm models, indicating a monolayer adsorption process. Tempkin isotherm parameters indicated that the adsorption process by MDA-SBA-15 was exothermic. The removal efficiency of Methylene Blue from aqueous solutions by MDA-SBA-15 was more than 90%, which was higher than the efficiency achieved by other nano-sorbents. This showed that MDA-SBA-15 could be used as an effective adsorbent in wastewater treatment. 1. Chew, T. L., Ahmad, A. L., and Bhatia, S. (2010). “Ordered mesoporous silica (OMS) as an adsorbent and membrane for separation of carbon dioxide (CO2).” Advances in Colloid and Interface Science, 153(1-2), 43-57. 2. Karim, A. H., Jalil, A. A., Triwahyono, S., Sidik, S. M., Kamarudin, N. H. N., Jusoh, R., et al. (2012). “Amino modified mesostructured silica nanoparticles for efficient adsorption of methylene blue.” J. of Colloid and Interface Science, 386(1), 307-314. 3. Debnath, S., Kitinya, J., and Onyango, M. S. (2014). “Removal of Congo red from aqueous solution by two variants of calcium and iron based mixed oxide nano-particle agglomerates.” J. of Industrial and Engineering Chemistry, 20(4), 2119-2129. 4. Nayab, S., Farrukh, A., Oluz, Z., Tuncel, E., Tariq, S. R., Rahman, H. U., et al. (2014). “Design and fabrication of branched polyamine functionalized mesoporous silica: An efficient absorbent for water remediation.” ACS Applied Materials and Interfaces, 6(6), 4408-4417. 5. Chen, Z., Zhou, L., Zhang, F., Yu, C., and Wei, Z. (2012). “Multicarboxylic hyperbranched polyglycerol modified SBA-15 for the adsorption of cationic dyes and copper ions from aqueous media.” Applied Surface Science, 258(13), 5291-5298. 6. Huang, C. H., Chang, K. P., Ou, H. D., Chiang, Y. C., and Wang, C. F. (2011). “Adsorption of cationic dyes onto mesoporous silica.” Microporous and Mesoporous Materials, 141(1-3), 102-109. 7. Shahbazi, A., Younesi, H., and Badiei, A. (2011). “Functionalized SBA-15 mesoporous silica by melamine-based dendrimer amines for adsorptive characteristics of Pb(II), Cu(II) and Cd(II) heavy metal ions in batch and fixed bed column.” Chemical Engineering Journal, 168(2), 505-518. 8. Zhao, D., Feng, J., Huo, Q., Melosh, N., Fredrickson, G. H., Chmelka, B. F., et al. (1998). “Triblock copolymer syntheses of mesoporous silica with periodic 50 to 300 angstrom pores.” Science, 279(5350), 548-552. 9. Mahmoodi, N. M., Khorramfar, S., and Najafi, F. (2011). “Amine-functionalized silica nanoparticle: Preparation, characterization and anionic dye removal ability.” Desalination, 279(1-3), 61-68. 10. Ho, K. Y., McKay, G., and Yeung, K. L. (2003). “Selective adsorbents from ordered mesoporous silica.” Langmuir, 19(7), 3019-3024. 11. Graham, N., Chen, X., and Jayaseelan, S. (2001). “The potential application of activated carbon from sewage sludge to organicdyes removal.” Water Science and Technology, 43(2), 245-252. 12. Liang, Z., Fadhel, B., Schneider, C. J., and Chaffee, A. L. (2008). “Stepwise growth of melamine-based dendrimers into mesopores and their CO2 adsorption properties.” Microporous and Mesoporous Materials, 111(1), 536-543. 13. Huang, C.-H., Chang, K.-P., Ou, H.-D., Chiang, Y.-C., Chang, E.-E., and Wang, C.-F. (2011). “Characterization and application of Ti-containing mesoporous silica for dye removal with synergistic effect of coupled adsorption and photocatalytic oxidation.” J. of Hazardous Materials, 186(2-3), 1174-1182. 14. Acosta, E. J., Carr, C. S., Simanek, E. E., and Shantz, D. F. (2004). “Engineering nanospaces: Iterative synthesis of melamine‐based dendrimers on amine‐functionalized SBA‐15 leading to complex hybrids with controllable chemistry and porosity.” Advanced Materials, 16(12), 985-989. 15. Wang, L., and Yang, R. T. (2011). “Increasing selective CO2 adsorption on amine-grafted SBA-15 by increasing silanol density.” The Journal of Physical Chemistry C, 115(43), 21264-21272. 16. Da’na, E., and Sayari, A. (2011). “Adsorption of copper on amine-functionalized SBA-15 prepared by co-condensation: Equilibrium properties.” Chemical Engineering Journal, 166(1), 445-453. 17. Albadarin, A. B., Mangwandi, C., Al-Muhtaseb, A. A. H., Walker, G. M., Allen, S. J., and Ahmad, M. N.(2012). “Kinetic and thermodynamics of chromium ions adsorption onto low-cost dolomite adsorbent.” Chemical Engineering Journal, 179, 193-202. 18. Yang, Y., Wang, G., Wang, B., Li, Z., Jia, X., Zhou, Q., et al. (2011). “Biosorption of acid black 172 and Congo Red from aqueous solution by nonviable Penicillium YW 01: Kinetic study, equilibrium isotherm and artificial neural network modeling.” Bioresource Technology, 102(2), 828-834. 19. Doğan, M., Abak, H., and Alkan, M. (2008). “Biosorption of methylene blue from aqueous solutions by hazelnut shells: Equilibrium, parameters and isotherms.” Water, Air, and Soil Pollution, 192(1-4), 141-153. 20. Liu, Y., Zheng, Y., and Wang, A. (2010). “Enhanced adsorption of Methylene Blue from aqueous solution by chitosan-g-poly (acrylic acid)/vermiculite hydrogel composites.” J. of Environmental Sciences, 22(4), 486-493. 21. Vargas, A. M., Cazetta, A. L., Kunita, M. H., Silva, T. L., and Almeida, V. C. (2011). “Adsorption of methylene blue on activated carbon produced from flamboyant pods (Delonix regia): Study of adsorption isotherms and kinetic models.” Chemical Engineering Journal, 168(2), 722-730. 22. Wang, S., and Li, H. (2006). “Structure directed reversible adsorption of organic dye on mesoporous silica in aqueous solution.” Microporous and Mesoporous Materials, 97(1-3), 21-26. 23. Monash, P., and Pugazhenthi, G. (2010). “Investigation of equilibrium and kinetic parameters of methylene blue adsorption onto MCM-41.” Korean Journal of Chemical Engineering, 27(4), 1184-1191. 24. Karagöz, S., Tay, T., Ucar, S., and Erdem, M. (2008). “Activated carbons from waste biomass by sulfuric acid activation and their use on methylene blue adsorption.” Bioresource Technology, 99(14), 6214-6222.